Just before Christmas my husband put the newspaper (app) under my nose – “You’ll LOVE this!” – and I scanned a story about a young lad who filled two trolleys of goods at the supermarket, paid using mostly discount coupons and vouchers he had foraged, and then gave the food to a homeless shelter. 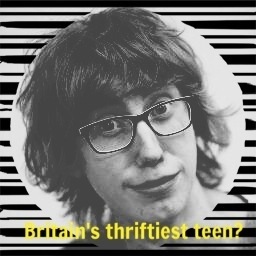 “This must be Britain’s THRIFTIEST, and most kind hearted, teenager!” I wanted to know more about this Jordon dude, so got in touch. Jordon explained that it was when his family began struggling financially that he got into hunting for coupons. He was only 15 but threw himself into it and began cutting costs for his family straight away. Tell me a bit about your childhood- what was it that got you into such extreme thrifting? As a child I had no interest in money saving at all! In fact I had no trouble spending my parents money (which I look back on now with regret) I actually started to save money after we were in financial difficulties. I stumbled across a TV show called “extreme couponing” which I immediately took an interest to. I started googling coupons and I found that it was doable in the UK, but not as extremely. After saving £20 a week and discovering that we could get things for free wasn’t worth missing! So I stuck with it, and still do. What do you reckon parents can do to help kids get wise about money saving? I’d say, it’s never too early to teach your kids about the importance of money and prices. I’ve played little coupon games with children as young as five with “putting coupons in ascending order of percentage off of retail”. It helps them with maths and teaches them to be frugal! Do you see yourself as playing a role in highlighting the tensions between powerful supermarket corporations and those in poverty? I always feel couponing is me VS the supermarket. How much can I get for paying as little. With food prices on the rise, even those not in poverty will be struggling this year. With couponing you can get nearly all of the things that you consume on a daily basis for a fraction of the retail price. My favourite tip is to try out wombling! Wombling is the process of finding disguarded coupons and receipts at or outside the supermarket. I regularly find price promise coupons just left in baskets or on the floor, and I find it quite fun to explore and see what I can find! I have regularly found price promises for over £5 at a time which adds up! Just remember to bring hand sanitizer! I love a bit of Sticking It To The Man-ness, especially when done by a young ‘un, and even more when said young ‘un helps others out whilst doing it. This decade’s Robin Hood or what? Nice one, Jordon. Get amongst Jordon’s thriftiness through his Coupon Shop UK page on Facebook or Twitter or follow him on Twitter.